Ever wonder what it ~really~ takes to be a beloved princess? Years of dressing up as a princess: Two years. Which princess do you normally dress up as? 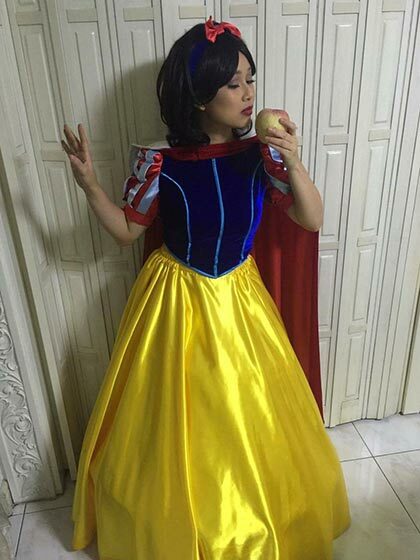 I’ve dressed up as every princess there out there—except Snow White! My role differs depending on the client’s request, and what my boss assigns me to be for the show! What do you love most about “being” a princess? What I love most about being a princess on weekends is getting to live out my childhood fantasy. I grew up singing along and playing dress up because of those movies, so it’s a dream come true to do this as a part-time job. How did you get started with this job? I was recruited by Madison Events, Inc. when I was in my second year of college when I was part of blueREP, Ateneo’s musical organization. This is something we only do on weekends since that’s when most children’s parties and mall shows take place. We usually meet three hours before show time to put on makeup, dress up, and rehearse. What do you find to be the most challenging part of what you do? The most challenging part of what I do is when the audience, especially the kids, is unresponsive to the show. We always appreciate kids who are more responsive and interactive during the shows, because it makes us feel like they’re really enjoying our performance and that we’re doing it right! Probably how fast theatre folk can perform a quick change. We could go from our normal clothes to a huge ball gown in less than a minute—sometimes even in a cramped car! When you feel disconnected from your work, how do you bring yourself back? Sometimes, it can feel disconnecting when we do the same roles/ scripts again and again. But the thing is, every show we do has a different audience and a different set of starry-eyed kids excited to see their favorite characters come to life! That always pushes me to do my best to stay in character and give my all during the show. I also find it refreshing when I get to work with people who are as passionate and excited as I am, and are willing to try to bring new things to the table. I think it was when we dealt with a demanding, hard-to-please client. The parents of the celebrant were very hands-on and were nitpicking all the details of our program, along with a lot of last-minute changes during the event itself. This can be very disorienting as a host, but I pulled through in the end! It was rewarding seeing the family happy and more than satisfied with the event. I can’t say for sure yet, but definitely doing something creative and exciting! Years of dressing up as a princess: Two and a half years! Which princesses do you normally dress up as? Anna and Moana—she’s more of a heroine than a princess—Belle, Jasmine, Rapunzel, Ariel, Aurora, Cinderella, Elena, and more. The princess I’ve been playing since day one is Princess Anna. What I love most about her, aside from the songs that she sings, is her energy. 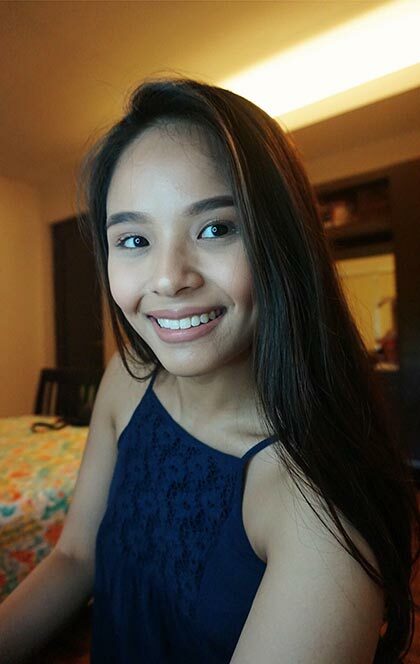 [I also love her] character—playing her never gets boring! I got this job at the end of my sophomore year in college. The bosses of Madison Events watched “In the Heights,” a musical production by the Ateneo Blue Repertory back in 2015, and I happened to be part of the cast with a talent of theirs. 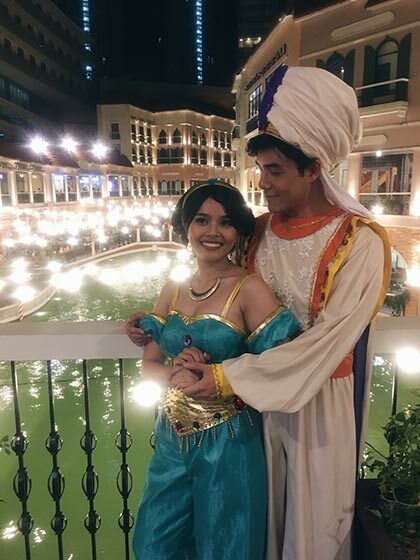 Weeks later, I got a text from that castmate asking if our other castmate and I could do a musical show as Elsa and Anna, and we happily agreed. For the rest of my college years, if I wasn’t in a musical production, I was performing for birthday parties on weekends. It was a part-time job that I looked forward to every week and successfully juggled with school. I remember there were some days when I would be drafting a paper or my thesis on my phone or laptop or studying for a test before a show or a rehearsal. Haha! Being a fresh college graduate, I’ve had more time to do shows with Madison Events. Aside from doing these weekend shows, I have also recently worked on other projects, such as Ateneo Blue Repertory’s “Stages of Love,” where I was the Musical Director. On weekdays, I’m either at Ateneo for rehearsals or at the Madison headquarters rehearsing for shows. After shows on weekends, if I could, I would run to rehearsals or shows in Ateneo. One of the most challenging parts of the job is to not take it for granted, especially when one sees other people doing so. After quite some time, one easily gets used to the routine, the people, and the work. This is especially challenging as one’s work ethic also sets an example for other talents, particularly those who are new. Sometimes, it does get difficult to play some characters—princesses or not—and especially if they’re new to me. Playing these roles isn’t just about memorizing the lines and choreography or singing the songs right. It’s also about the way these characters are embodied, the way they move and speak. They’re all different. It’s surprising to think that I would get nervous for some of these mini-shows when I’ve already had experience performing in front of larger audiences. And although it’s something I’ve been doing for almost three years, it still happens sometimes! I remind myself of how much I wish I could be doing this on days that I don’t [perform]. As cliché as it sounds, I try my best to see the fun in whatever show I’m doing and just allow myself to pour all my energy into the show. Seeing all the kids—how they react and seem to believe that we’re the actual characters—motivates me a lot as well! I remember being proud of myself when I musically directed Ateneo Blue Repertory’s “Stages of Love” on my own. I not only felt accomplished for managing the music—teaching the notes, creating the harmonies, and helping the cast with their singing—but for also teaching them some of the most valuable lessons that I’ve learned as a performer. 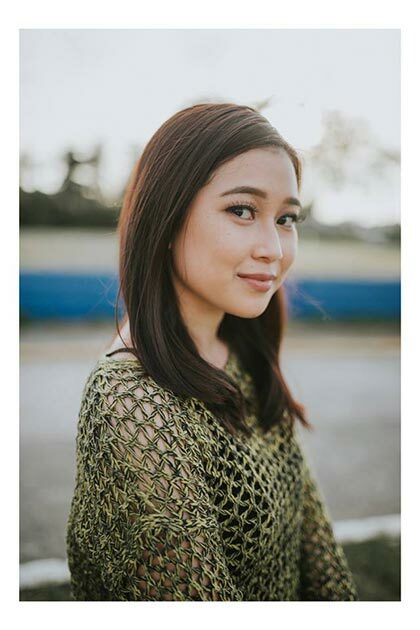 The future honestly looks a bit hazy to me, but I do hope that years later, I will find myself pursuing my passion—be it as a performer or as someone in a communications-related industry. Years of dressing up as a princess: More than three years. Name a princess (or any kids’ show character) and I’ve probably dressed up as her! But I am mostly Princess Anna. 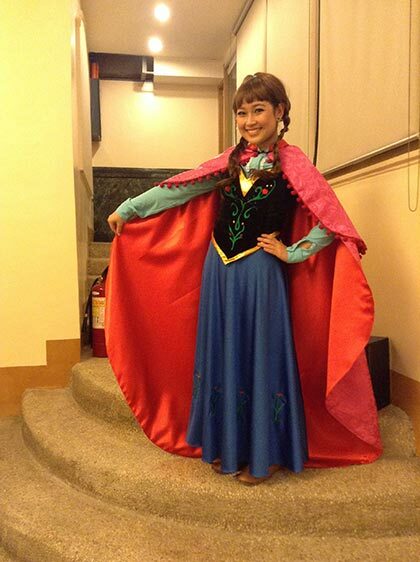 What do you love most about being Princess Anna? I love that I get to play around with the character because she has so much personality! I love how she’s the easy favorite of most kids as well, so it’s fun to connect with them. I am foremost a musical theatre actress full-time. 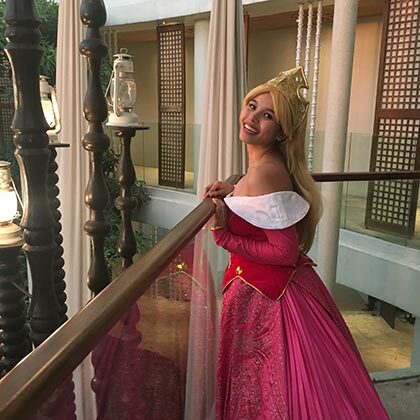 Most theatre actors branch out to doing voice acting, commercials, and performing for corporate or personal events such as these princess shows. Most of us get referred or get hired if they see a performance of ours that they liked. It really varies. For princess gigs, I usually warm up my voice and body before leaving for work. Dressing up and looking the part takes around two hours. If it’s a group show, we rehearse before going on. The actual job entails doing a 30- to 45-minute musical show with a meet and greet after. Believe it or not, smiling the entire time! It seriously hurts to smile for so long! Any princess role is not just sparkles and rainbows. We are required to act according to the character at all costs and sustain energy, regardless if you’re having a bad day or if you’re sick. We have to memorize a looot of songs and scripts too! What’s the worst career advice you’ve ever heard? That having talent is already enough. To show up underprepared, not giving your best is a no-no. I’m a firm believer in professionalism and discipline, and I take my job quite seriously. It can be physically and mentally draining, so I do vocal rest, and take a break from memorizing so I don’t get burnt out and can focus for the next gig. Whenever clients commend a job well done or request for me! In this industry, it’s very hard to tell. I just hope I’m doing more challenging roles in theatre and getting better at my craft!